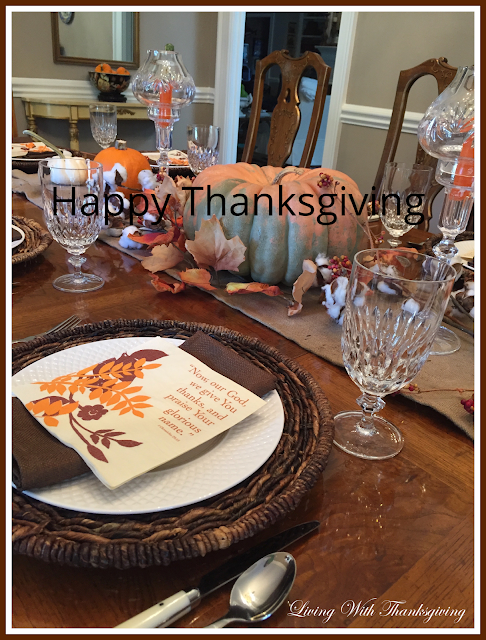 I am glad you have joined me and a myriad of other talented tablescapers for a Thanksgiving blog hop sponsored by Chloe Crabtree from Celebrate and Decorate. A complete list of posts you will want to visit can be found at the end of this post. 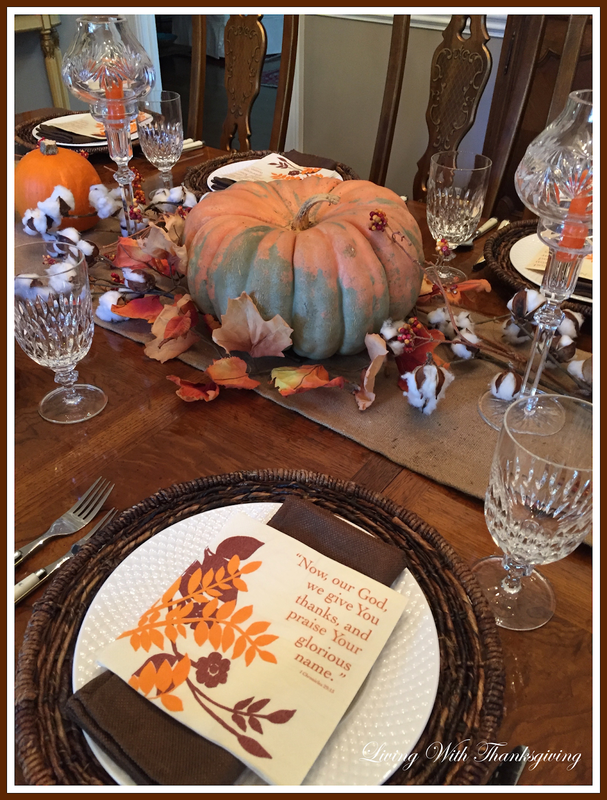 Welcome to our home for a simple, almost plain family Thanksgiving dinner tablescape. The dishes and cutlery I chose all go in the dishwasher for ease and more family time. There are ten of us so that's important and they will be here for several days. I usually fuss with fresh flowers, which I love, but this time a fresh real pumpkin graces our table for a centerpiece with a touch of southern cotton, faux bittersweet and fall leaves with a few smaller pumpkins added in. 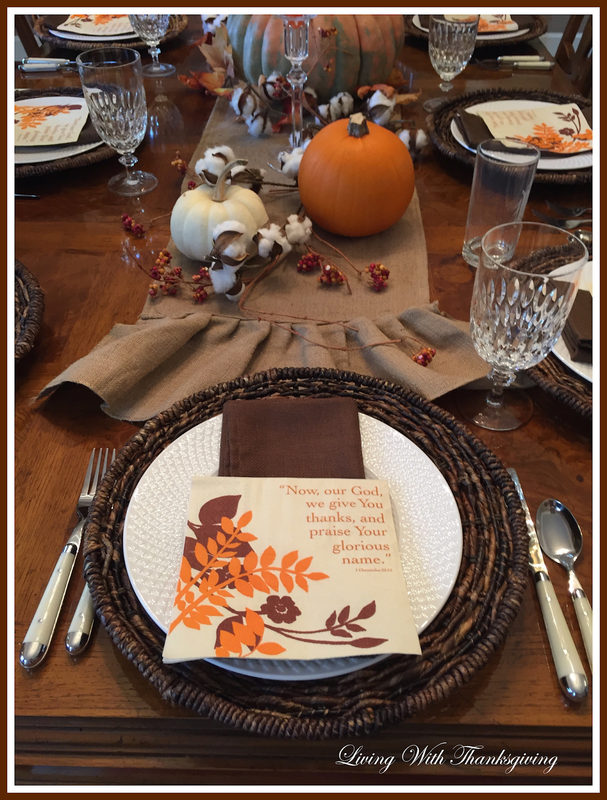 This year, I chose to use a simple burlap runner and let the burled grain of my table show. I usually use a tablecloth which does photograph better but decided to change it up this time. Rattan chargers add an organic feel juxtaposed with the crystal goblets and crystal candle holders that add a touch of glam. The candle holders are special to me as they graced my beloved mother-in-law's table for years. I get emotional just thinking of the many family dinners at her home. Now, the scripture on this paper napkin sums it all up to me. Thanksgiving is about being thankful to our Creator for all our blessings. 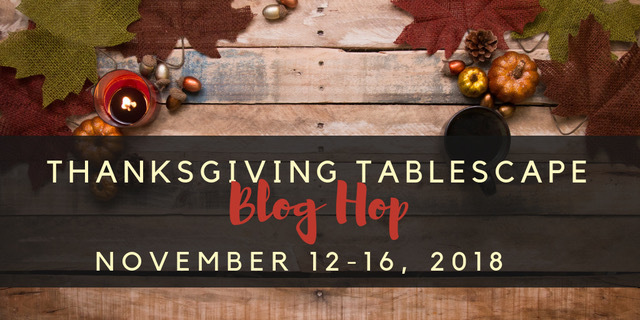 You can view last year's Thanksgiving blog hop table here. It was more dramatic and also included a family tradition of using a set of Pilgrim salt and pepper shakers. I forgot them this time. A prior typical Thanksgiving breakfast can be viewed here. I usually do a full breakfast in the kitchen and then a late lunch in the dining room. We are all ready for a long walk after the big meal. Here's my casual table for ten and you can see my little nest where I blog in the other room complete with clutter and the lamp on, that I didn't notice until now. I couldn't resist including some shots of our food from last year. That is my son, a Lieutenant Colonel in the U.S. Air Force. Now, how did I get that old? Where did the years go? 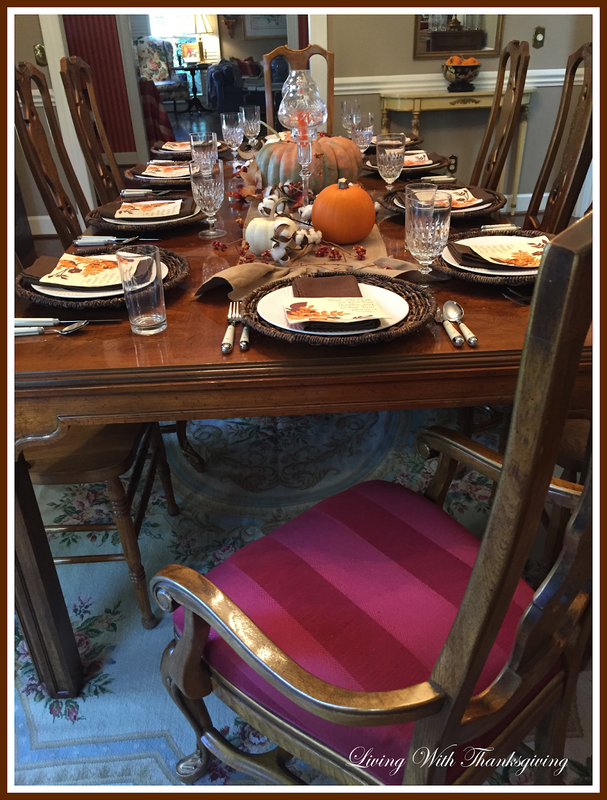 It is so much fun to see all the different tablescapes for an occasion like Thanksgiving. Thank you, Chloe, for organizing the blog hops. They can be formal or casual, simple or elaborate but they reflect the personality and mood of the designer on a given day. That's why I like blogging and tablescaping and blog-hopping. I enjoy the challenge of using what I have in a different way and seeing my other blogging friends doing the same thing with their creations. Speaking of blogging friends- Do you ever reread your comments from old posts? They grab my heart. Bloggers are so encouraging and kind. I'd like the world to be so kind. Have a wonderful day. If it is your first time reading Living With Thanksgiving I hope you will come again. Please enjoy reading the other bloggers posts listed below. This is wonderful, Bonnie. Just wonderful. And you were so clever and wise to do this last year intentionally for this year! I always wonder how fellow bloggers have the wherewithall to set up a full and glorious table a week or two ahead of the day. I mean, rehearsal is great, but it takes time to do that! It looks like you have quite a feast and I'm glad you shared your son's photo. I hope he is safe and thank him for his service from me. Bonnie, the napkins are my sentiments exactly. I agree with Jeanie, how clever you were to photograph your actual meal last year to share with us this year. Your food looks so delicious. I love your tablescape, seeing the burl wood of your beautiful dining room table and the natural elements for a centerpiece. As much as I love flowers, they can get in the way of seeing the sweet faces of our family. Thank your handsome son for his service to our country. This table is simple elegance at its best, my friend. What a perfectly honest and beautiful Thanksgiving table, Bonnie. First of all, a thank you to your handsome son for his service! Although the table is different than any I've seen you style, it most definitely speaks to the heart with a genuine sentiment for family and what matters at any gathering. Keeping it simple so time can be enjoyed should be everyone's objective! I love the table runner with centerpiece of pumpkin, cotton and bittersweet. I'm so glad you could add your mil's vintage candle holders. That connection deepens the sentiment. Bonnie, your table could not be more beautiful. And, I so agree that what is important is the time spent with your family. Your candle holders are lovely and I am sure your mother-in-law would be so pleased to see them on your table. Enjoy this special time of the year ~ blessings to you and your family. Bonnie, you table is so pretty. Totally different than your usual style, but I adore it. It's good to change things up. The nakin message is perfect. Kudos to your son for serving for his country. What lovely candle holders and the history behind them, definitely treasure. The menu sounds perfect. I love cornbread dressing. 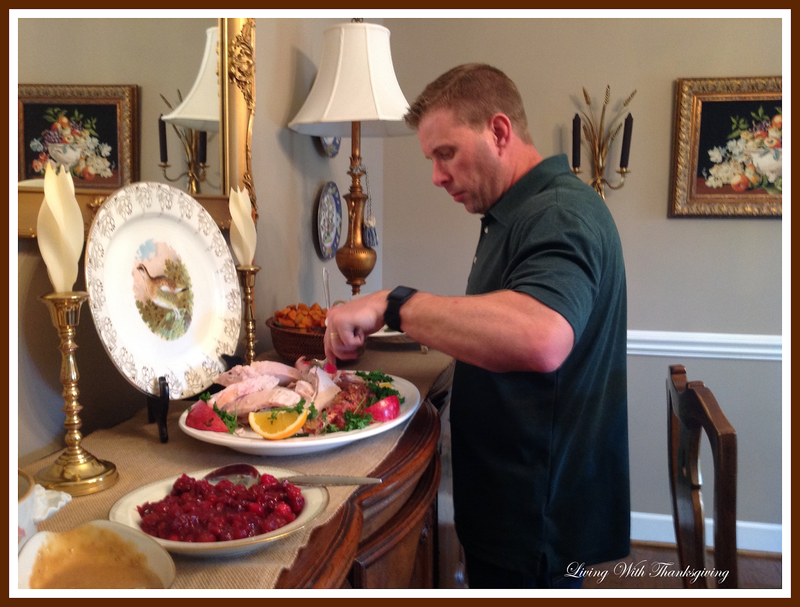 A pleasure to share in this wonderful Thanksgiving blog hop. What a lovely, lovely table and I do love those napkins with that sweet sentiment. Smart gal to do these pics a year ahead of time. I'm going to remember that idea. Have a happy new week! Bonnie, your photograph of a Thanksgiving meal has me even more excited about the meal to come! But, more importantly, your sweet sentiment is just perfect. I absolutely love the relaxed, rustic feel of your table - it's very genuine and heartfelt. I hope you and your family have a lovely Thanksgiving! Your "simple" tablescape looks wonderful for me...So elegant!Hugs! You are so smart to keep things simple this year when you have family staying over. Dishwasher is the way to go! 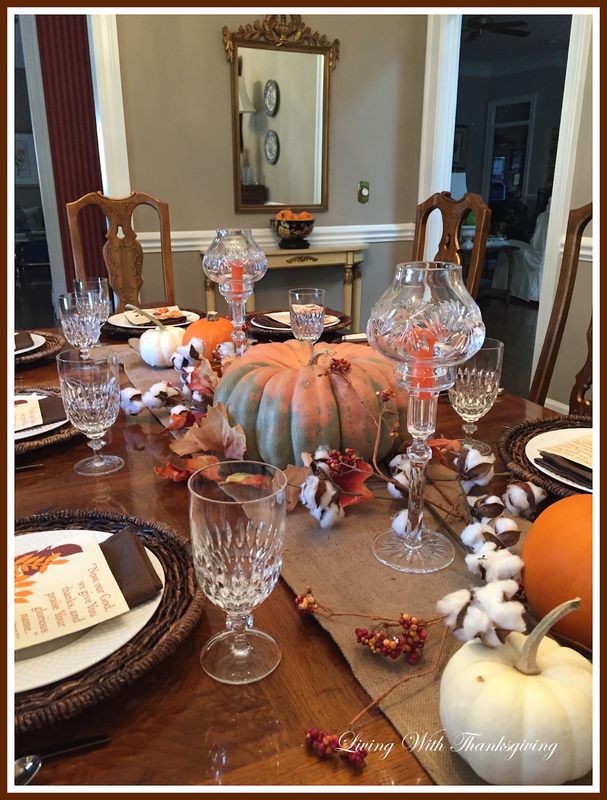 I love your pumpkins and cotton, and the rustic look of your table, perfect for Thanksgiving! You sound relaxed and ready for family fun this year, always a special gathering time. How proud you must be of your son! Please thank him for his service. I retired from Boeing last year, where many of my office mates had previous served in the Air Force and Navy. Today on Veterans Day, I fondly remember my father-in-law. He was a German POW in WWII. My table later this week, honors his great-great+ ancestor, who fought in the Revolutionary War. Your storytelling, photos and table warmed my heart. Bonnie, your table is just beautiful! I love the natural elements, and the pumpkin, bittersweet, and burlap runner make the perfect centerpiece. I hope that you and your family have a wonderful holiday! Happy Thanksgiving, sweet friend!!!! Bonnie, beautiful tablescape. It’s nice to scale down a bit occasionally, although your table seems as lush and full as ever. The pumpkin centerpiece is a great focal point. I love your burlap runner, cuz who doesn’t love burlap? Bonnie, I am all about plain and simple this Thanksgiving! Your tablescape is anything but plain. Your charger plates are gorgeous and look great with the crisp white plates. I love your ruffled burlap runner topped with pumpkins and other natural fall elements. It really speaks to the season. A pleasure blog hopping with you this week! 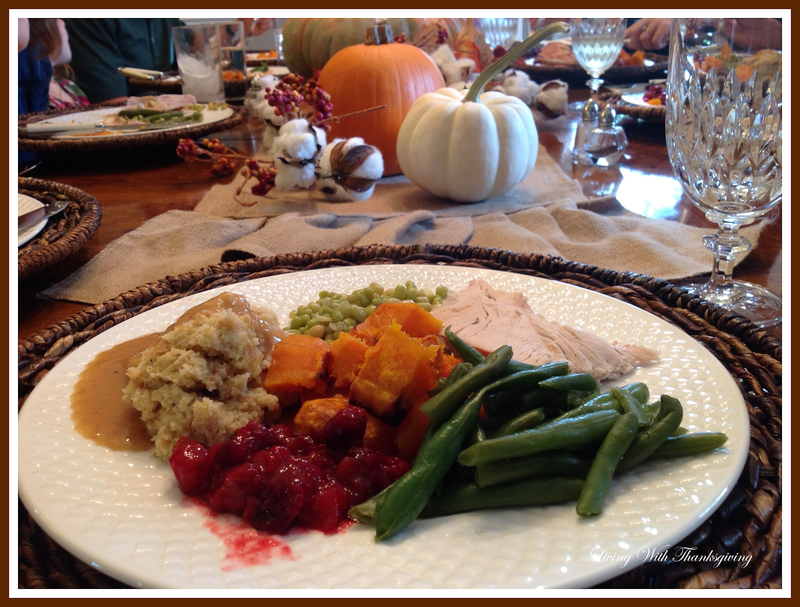 Your shots of last year's dinner have me drooling for a turkey dinner now! How wonderful to include your son on Veteran's Day, we are thankful to him for his service. Your table is wonderful, it speaks perfectly to the occasion. I love how cotton has made such a statement for many, but since we are about the farthest thing from cotton in Ohio, I feel I cannot use it - but that doesn't stop me from liking it when I see it! That's the wonderful thing about these hops, we are all from different regions and climates - it is always interesting to see how everyone decorates. Have a wonderful Thanksgiving with your family! Beautiful table! I like the texture of the burlap runner, dried bittersweet and the real pumpkin! I love the pictures of last year’s feast and seeing your son. God bless him for his service to our country! Wishing you and your family a wonderful Thanksgiving! After looking at your delicious meal, I'm really getting excited for the holiday. You've created a beautiful table to share with your family and I hope your holiday is filled with love. Happy Thanksgiving and it's been fun to hop with you. All of the natural elements are a perfect way to style a table for Thanksgiving. The burlap runner, cotton, bittersweet and pumpkins all lend to the bountiful feel of your table. Thank you for your son's service, how wonderful he could join you for the holiday, I hope he can do so again this year. May you be blessed with family and friends gathered around your table this Thanksgiving. I love the simplicty and ease of your table. The perfect space the gather the family for a meal. How wonderful to use the candle holders that were your mother-in-law's. Bonnie, the only thing simple about your table is that it's simply elegant! I'm a true believer in decor does not have to be complex to be gorgeous, and your table proves it! So happy to be hopping with you! What a perfect table for celebrating Thanksgiving, Bonnie. I love when your share your MIL's special things and the memories of her table. Yes, how did the years fly by with our own children?? Happy Thanksgiving blessings to you and your family. Such a lovely table, Bonnie, your guests will feel very appreciated, especially with all the memories. I hope you are enjoying your Thanksgiving weekend.